Following on from my article yesterday about the facts and truths about the sale of Swansea City to the Americans, I’d like to share some further truths with fellow Swans fans. In light of the inaccurate comments made earlier today by selling shareholder Rob Davies – accusing the Supporters Trust of causing the damage to the club after they sold their shares to 27 American speculators. They all say the Trust was fully involved at the start. 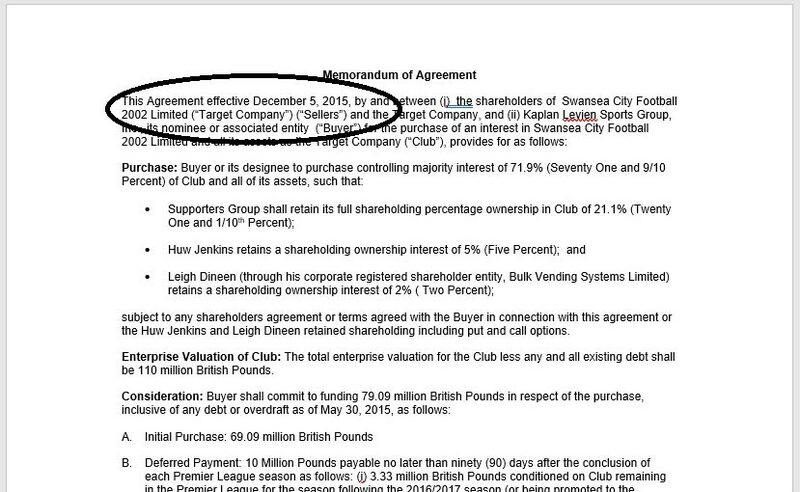 So here is a screenshot of the Memorandum of sale that the old shareholders worked with the Americans on. As you can see, this document was dated 5th December 2015 – some 3 months before they had the courtesy to even inform the Swans Trust of what was happening! What I find even more stunning than their comments, is the fact that an agreement like this would have taken at least a good few months to work out. So there you have it, further proof that the everyday fans of Swansea City were kept out of this sale. More facts and truths about the Swans sale will follow soon and shed ever more light on how the existing shareholders operated during the sale.